Hi Franklin Delano Roosevelt (Enero 30, 1882 – Abril 12, 1945) amo an ikakatloan kag-duha nga Mangulo han Estados Unidos (Marso 4, 1933 – Abril 12, 1945). Burns, James MacGregor (1956). 'Roosevelt' (vol. 1). Easton Press. ISBN 978-0-15-678870-0. Winkler, Allan M. (2006). Franklin D. Roosevelt and the Making of Modern America. Longman Publishing. ISBN 0-321-41285-0. Bellush, Bernard (1955). 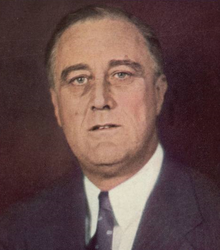 Franklin D. Roosevelt as Governor of New York. http://www.questia.com/PM.qst?a=o&d=99016750. McCullough, David (1992). Truman. Simon and Schuster. ISBN 0-671-86920-5. Schweikart, Larry; Michael Allen (2004). A Patriot's History of the United States. Easton Press. Burns, James (1970). Roosevelt: the Soldier of Freedom. San Diego: Harcourt Brace Jovanovich. ISBN 978-0-15-178871-2. Keylor, William (1998). The French Defeat of 1940; Reassessments. Berghahn Books. Reynolds, David (2006). From World War to Cold War: Churchill, Roosevelt, and the International History of the 1940s. ISBN 978-0-19-928411-5. http://www.questia.com/read/115097016?title=From%20World%20War%20to%20Cold%20War%3a%20%20Churchill%2c%20Roosevelt%2c%20and%20the%20International%20History%20of%20the%201940s. Roosevelt, Franklin D. (2005). My Friends. Kessinger Publishing. ISBN 1-4179-9610-2. Ini nga pakli kataposan nga ginliwat dida han 02:49, 30 Nobyembre 2014.